Gallstones. 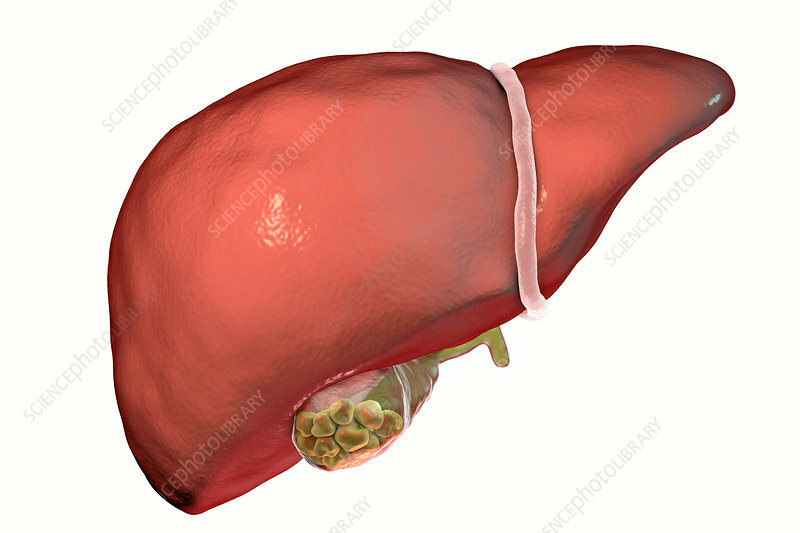 Illustration showing the liver and gallbladder with gallstones. The gallbladder stores bile, the digestive fluid that is produced by the liver (above gallbladder) and passed to the small intestine. Gallstones, hard deposits formed of cholesterol and bile salts, form in the gallbladder when there is an imbalance in the chemical composition of the bile. Gallstones are usually symptomless, unless one obstructs the bile duct, causing acute pain, jaundice and infection. Treatment is with drugs to dissolve the stones or surgical removal of the gallbladder.